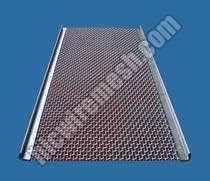 Coarse type of wire mesh are normally used for making screen for vibrating machines screen for vibrating machines. Screens are woven accurately to the mesh size with appropriate wire or rod to meet specific requirements. Screens are offered in spring steel, mild steel, galvanized steel and stainless steel to suit particular applications. In vibratory finishing, energy in the form of vibratory forces is transformed by the machine's drive system into a mass of loose media and then into the parts. The entire load is in motion at the same time so that the media act against the parts throughout the complete mass. Basic elements of the system include the machine, the media, and the compound and/or water solution. Selection of each depends primarily on the parts being run - that is, the type of parts: size, shape, and condition; and the work to be accomplished.